The Last Colony is a great book by John Scalzi. I've read it a bunch of times but I just re-experienced it in audiobook format for the first time. It's a really good audiobook too. 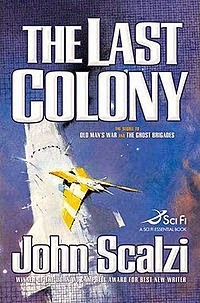 The Last Colony is part of my favorite Scalzi series, the Old Man's War books. It's a universe where humans are colonizing, aliens are generally upset with us for doing so, earth is treated like a military recruitment center, and super-humans are green. I can't do the setting justice, but I can say it's one of my favorite book series ever. I highly recommend The Last Colony. If you're interested in the series you should probably start with Old Man's War but you can feel free to skip the second book and move right into reading The Last Colony. It actually provides a much better paced story if you skip the second book, Ghost Brigades, and jump right into The Last Colony instead. There are so many cool sci-fi things in this series. I don't want to spoil any of them by giving you plot information though. I'll leave you with this... If you are a Sci-Fi fan you absolutely owe it to yourself to pick up Old Man's War and get acquainted with this amazing series.